Everyone in town knows that you’re out here. No one cares. The weather is dropping several degrees a minute. You know you will die of frostbite, or be eaten by wolves before anyone comes. Although they they know that you’re out here, no one knows which direction to head in order to find you. This. Is. The. End. Imagine being entangled, on your own trap-line, in your own snare, taunted by the food and sleeping bag on your sled, just within a few steps away. Everything that is needed to survive out in the thick, white, snow blanketed forest is only about three strides away. This life of trapping does take place in modern times. Every family and household survives off of hunting and snaring animals throughout the woods to survive the white, harsh frozen winters. There are other small villages up and down the river-side, all with other family trap-lines, although none as long as the twenty mile trap-line of Albert Least-Weasel who has owned it in his family for many generations. Consequently, Albert Least-Weasel, who is in his late seventies – early eighties has been trapping on his family’s line since he was a teenager. So, when he stays up on the trapline for many days too long, everyone except his worrying grandson, thinks that he might be hurt or in horrible trouble and danger. The novel not only discusses Albert Least-Weasel being imprisoned, but each chapter gives a paragraph of an old Indian tale of how the Indians may have lived before and the similarities of how they live now. For instance, the first paragraph of the tale is. 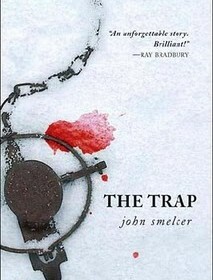 The Trap by John Smelcer is a realistic fiction tale of a small village on a river bank, housing communities of trappers trying to survive in the dead of Alaska’s winter competing with every living thing hunting for its life including humans. This is a gloriously heart touching novel of how Albert Least-Weasel was able to survive against below zero degrees of weather for five days. Before Albert Least-Weasel is found, the fear of not being found by another human being before the wolves find him, almost makes him give up on any sliver of hope that has been kept. I enjoy the author’s style of fully explaining details of how every little thing in town reacts to the frost, for example the dogs; “Even the sled dogs did not come out from their little dog houses. They lay curled on straw beds with tails wrapped tightly across their noses, dreaming dog dreams of summer and salmon strips drying on racks in the sun.” This shows how he, the author, even gave the sled dogs thoughts and dreams. If you enjoy a good novel of cold truth and hope, this is a great book for you. Even if you enjoy books with weather and survival in the harsh elements this is a great novel.